Real Madrid superstar Gareth Bale has all but sealed a derby day victory for Los Blancos with this goal for Santiago Solari’s side in the 74th minute. 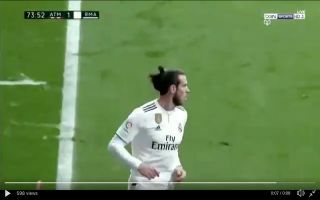 Bale punished Atletico, with Santiago Arias nowhere to be seen – Bale was left completely unmarked on the left wing, midfield maestro Luka Modric picked out his teammate with an inch-perfect pass. The Welsh wizard managed to hammer the ball into the back of the net from a tight angle. Santiago Solari has managed to turn around an awful start to the season for Madrid and it looks as though the side could still be a serious threat in the Champions League.